The playwright Bertolt Brecht was born in 1898 in the German town of Augsburg. After serving as a medical orderly in the First World War and appalled by the effects of the war, he went first to Munich and then to Berlin in pursuit of a career in the theatre. That period of his life came to an end in 1933 when the Nazis came to power in Germany. 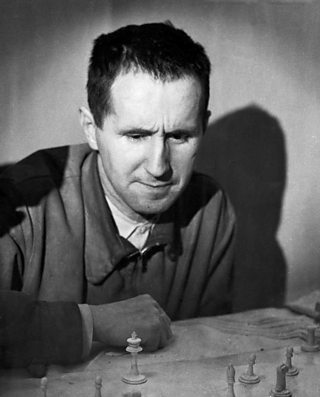 Brecht fled and during this period the Nazis formally removed his citizenship, so he was a stateless citizen. As an artist, Brecht was influenced by a diverse range of writers and practitioners including Chinese theatre and Karl Marx. The turmoil of the times through which Brecht lived gave him a strong political voice. The opposition he faced is testament to the fact that he had the courage to express his personal voice in the world of the theatre. He also had an original and inspired talent to bring out a dynamic theatrical style to express his views. way the Nazis came to power.